TRIBUTES: Norris Cole returned to Tel Aviv to a warm welcome to the home team and fans, and so did Vasilije Micic in Kaunas. Darussafaka used its visit to Podgorica to award Buducnost forward James Bell with a ring for helping Darussafaka win the 7DAYS EuroCup title last season. 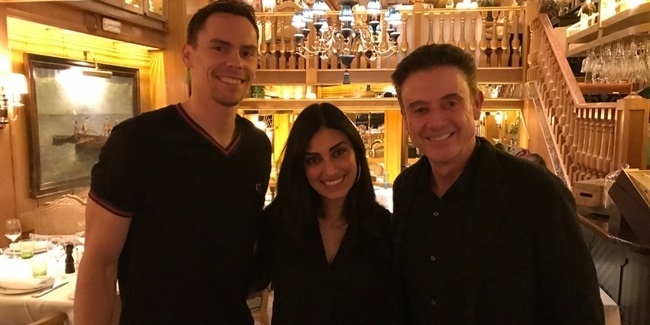 COACHES TAKE THE MEMORY LANE: Anadolu Efes head coach Ergin Ataman talked about winning the EuroCup title with Galatasaray Istanbul, while Panathinaikos head coach Rick Pitino re-united with Barcelona sharpshooter Kyle Kuric, who played for Pitino at the University of Louisville. GET WELL SOON, ANTANAS: Zalgiris center Antanas Kavaliauskas successfully underwent abdominal surgery, and was already thinking about his teammates: “All went well, didn’t feel a thing!!! Let’s get this W!! !”, he wrote on Instagram from his hospital bed. GENDER REVEAL: Maccabi center Alex Tyus and his wife are expecting their second child. They came up with a very original way to reveal baby’s gender. Check out the video! FUNNY KALINA: Nikola Kalinic with a funny GIF. TABLETOP BASKETBALL: Anyone who does not remember at least one version of this tabletop basketball toy? Rudy Fernandez went back in time with his son. STRONG RECCOMENDATION: Another week means another The Crossover podcast with Joe Arlauckas. This one, with one and only Kyle Hines. Great Conversation and Great Stories!!!!!! EUROLEAGUE TOURISM: During EuroLeague road travels there is never much time for anything other than basketball, but FC Bayern Munich players did not just sit in their hotel rooms rather took a nice walk in Athens. DOUBLE-WINNERS’ CORNER: Anadolu Efes, Real Madrid, Maccabi FOX Tel Aviv and FC Barcelona Lassa all got the job done, winning twice in 48 hours this past week. Good win on the road in Milano! WINNERS’ CORNER: Panathinaikos, Olympiacos and Baskonia might not have managed to win on the road this past week, but they did successfully protect their respective home courts. Great win yesterday. Heading to Spain to play Barcelona. Looking forward to having dinner with one of my favorite players, @KingKK_14 . Hard fought W! Definitely needed that!